What material is the pump made of? The FR pumps have an aluminum die cast body. Most models have a protective dichromate finish (96 hours) and the marine models have additional corrosion protection (1,000 hours), meeting the ASTM B-117 spec. for salt spray. Can the pump be used for both negative and positive ground systems? Only “neutral ground” pumps may be used on positive ground systems. Will the pump push and pull fuel? The FR pumps will “push” and “pull” fuel, but it is preferable to “push” fuel. Are the pumps Coast Guard approved? The marine models (FRB-13, FRB-16, FRB-20, FRB-22 and FRB-23) are coast guard approved and include additional corrosion protection for use on diesel or gasoline marine applications which meets the ASTM B-117 spec. Should I install a pre-filter to protect the pump? Walbro recommends a 70 micron filter. On carbureted applications why do you recommend that the pump be mounted 12″ below the carburetor? This is recommended as a precaution in case of carburetor float failure, so the fuel is not siphoned easily. Will fuel flow through pump even when the pump is not running? What size fuse should be used with FR pumps? A 5 amp fuse is recommended. What if I already have a mechanical pump in my system? 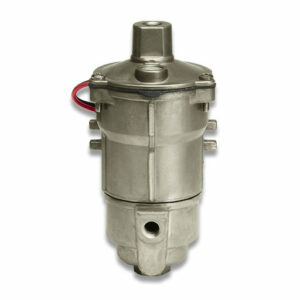 The electric fuel pump is easily installed in the fuel line between the fuel tank and carburetor. The old mechanical fuel pump can be removed and the mounting hole covered OR the electric pump can pump right through the mechanical pump as long as the mechanical pump’s diaphragm is not ruptured. FR pumps will produce an audible clicking sound when cycling. FRA and FRC pumps will run at a constant rate (fixed frequency), regardless of the fuel flow rate. FRB and FRD pumps will slow their cycling as the fuel flow rate drops. How do I know if I need to replace the filter on my FRB or FRC? The filter may need to be replaced if you are experiencing insufficient fuel flow. To replace filter, use a 19 mm or ¾” hex wrench to loosen screw on the bottom of fuel bowl.